Rumor: Anne and Henry wore yellow to mourn the death of Catherine of Aragon because it was the color of mourning in Spain. Some accounts report both Anne and Henry wearing yellow to show their respect. Some accounts report just one wearing yellow. Possible Source: This rumor has been floating around the internet for some time. Its origins are not completely unfounded. Edward Hall, the chronicler, reported that Anne wore yellow for mourning. Either way, the color of mourning in Spain was black, not yellow. When Juana the Mad’s husband died (shown above), she ordered all her ladies to wear black. When she herself died, Charles V wore black. And when Philip II died, a proclamation ordered by his son, Philip III sent the country into mourning. In Seville, so much black fabric was sold that it created a black market on black clothes. 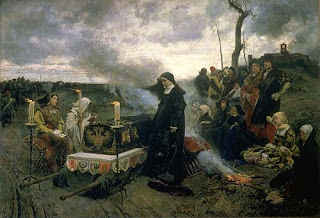 (no pun intended) In fact, when Chapuys was invited to attend Catherine’s funeral, he was offered black cloth to mourn his beloved queen, not yellow. Sorrowful Tears or Dancing on the Grave? We can only guess as to why Anne and Henry were callous enough to wear yellow. Henry was certainly relieved at the death of his ex-queen for it meant that he no longer had to fear any meddling from her nephew, Charles. Catherine’s death signified a brief respite from the fear of Spanish invasion. For Anne, it signified the death of her greatest rival. There seems to be this trend lately amongst Annophiles to raise the tragic queen up to sainthood as a woman incapable of any blame. I personally don’t see any figure who usurps another women’s position as a feminist role model. 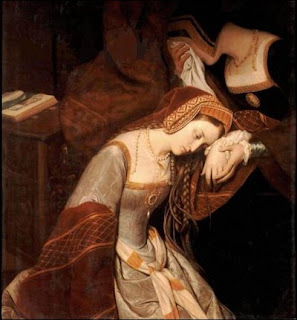 Whether you choose to see the controversial Anne Boleyn as harlet or heroine, neither Henry nor Anne were feeling twangs of compassion over Catherine's death. The two lovers were as joyous as their yellow attire. (1) SP January 1536, 21-25, 141. Chapuys to Charles V, 21 Jan.Vienna Archives. Love it, love it! The Tudors are so my favorites.... I'm so glad that you're writing about them, thanks!!!!!!!!!!!!!!! OH i love tudors history as well and read as many books as possible .. just starting on autobiograpy of henry.. to see how he will justify his acts..
katherine of aragon is my fav.. she suffered so much..
there is no justification for how manipulative Anne Boleyn was .. and no way she was mourning Katherine's death..
with katherine's death.. Anne hoped to finally recognized as the QUEEN. wrong.. he quickly realized how hard it will be hold on to the king.. Thanks for an interesting post! And yes, I agree, any women who purposefully steals another woman's husband is certainly no saint! Hi. I'm really looking forward to the Tudor posts, Bearded Lady! thanks. I had read that the color yellow was the color of mourning in spain, which struck me as strange since the rest of Europe wore black- thanks for this post and clearing that up! Tired of the Tudors? Not a chance. There is no way Anne and Henry were in mourning. Henry might possibly have felt a twinge but by the time Catherine died, he was probably so enraged at her for not acceding to his wishes he was thankful not to have to deal with her anymore. "I personally don’t see any figure who usurps another women’s position as a feminist role model." Yes, because Anne did it all on her own and Henry had nothing to do with it. If not for Anne, it would have happened with someone else. It was bound to happen. Henry wanted a male, legitimate heir. Anne had no choice.